This powder is the secret ‘sauce’ for the famous Iyengar puliyodarai. Puliyodarai, or pulihora is a rice that is made with a tamarind gravy and is a popular travel and picnic food. It’s tangy, spicy and just good! 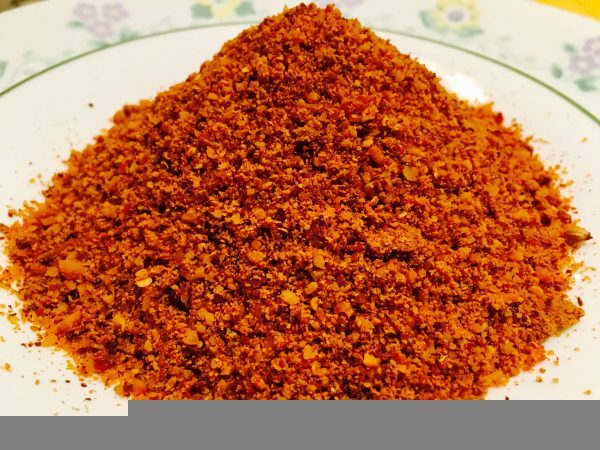 This powder (podi as we call in Tamil) is made with a few spices that are so flavorful, and lift the ordinary tamarind rice made with just the tamarind gravy to the next level. It’s the signature dish sold in the famous Parthasarathy temple in Chennai, which is where Raj took me on most of our dates pre-marriage! Look for two more posts on making the whole puliyodarai. Transfer to a clean glass container. Used as a final seasoning for dry curries, but most importantly as a finishing touch for authentic Iyengar puliyodarai.